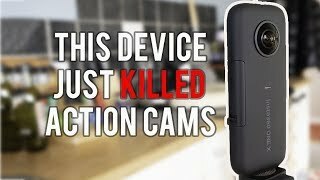 Our verdict of the Insta360 One X: 10/10 - It's rare that I'm so impressed by a piece of technology, but there's just something magical about the Insta360 One X. Just don't buy one if your target output is VR: there's a new model that shoots in 180-degree stereoscopic format for that. 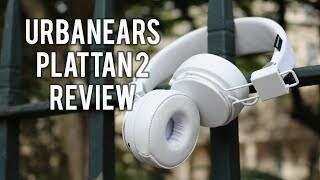 Our verdict of the Urbanears Plattan 2 Bluetooth Headphones: 7/10 - The Plattan 2 Bluetooth from Urbanears are comfortable, well-designed, and absolutely worth the money. 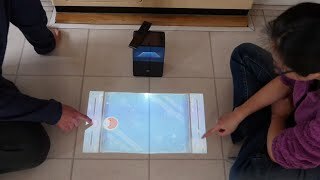 Our verdict of the PuppyCube Projector: 4/10 - The hardware is straight out of a sci-fi movie, and the touchscreen projection actually works. Unfortunately, with dodgy third party app stores and a host of compatibility issues, the OS is unusable at the moment. GET $20 OFF WITH COUPON CODE "MUOVAC"! 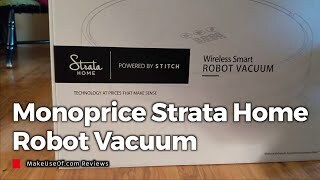 Our verdict of the Monoprice Strata Home Robot Vacuum: 8/10. A solid budget robot vacuum for the price. But if you don't need a smartphone app/voice assistant controls, or your home has a complex layout, look elsewhere. Our verdict of the UniFi Protect: 10/10 - Ubiquiti has set a new standard in home camera systems. 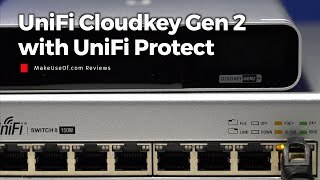 With exceptionally designed products with a great price point, there's so much to love about UniFi Protect. Our verdict of the Moza Air 2: 9/10 - The Moza Air 2 is heavy and lacks travel portability, but it's well-designed and delivers great performance. 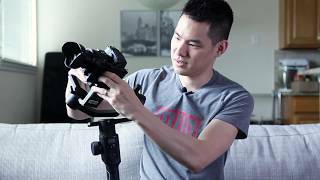 It's an excellent choice for getting the most value per dollar spent on a prosumer gimbal. 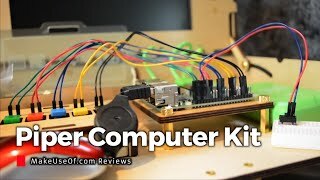 Piper Computer Kit for Kids: Review and Giveaway! Our verdict of the Piper Computer Kit STEM Learning Toy: 9/10 - If you're looking to kickstart your child's STEM skills, this Raspberry Pi-powered, Minecraft-centric, feature-packed learning kit is a great option, although it is a bit pricey. 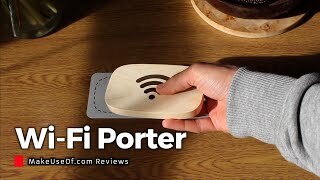 ur verdict of the Wifi Porter: 9/10 - The Wifi Porter is a deceptively simple, well engineered, NFC-enabled device that'll have you connected to a Wi-Fi network in just a single tap. 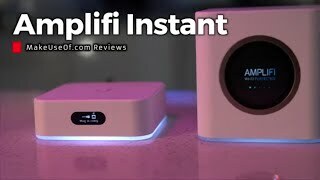 At such a disruptive price point, the AmpliFi Instant is beautifully designed, and loaded with features. 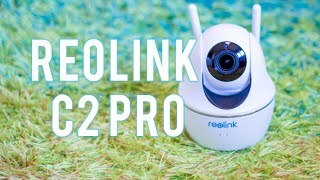 This makes it one of the best mesh Wi-Fi solutions on a budget. 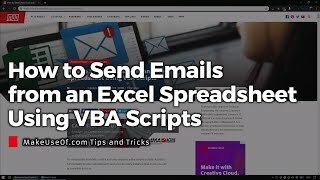 To send emails from Microsoft Excel only requires a few simple scripts. Add this functionality to your spreadsheets and you can really enhance how much you can accomplish in Excel. Processing is a powerful tool which allows the creation of art through code. 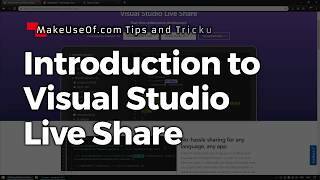 It is the combination of a Java library for working with graphics, and an integrated development environment (IDE) which allows you to write and run code easily. 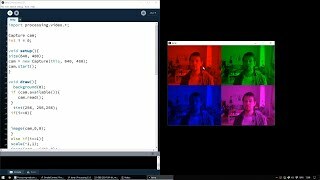 There are many graphics and animation beginner projects which use Processing, but it is also capable of manipulating live video. Today you’ll be making a live video slideshow of different effects controlled by the mouse, using the Processing video library. As well as inverting the live video, you’ll learn to resize and color it, and how to make it follow the mouse cursor. Blocking people is an excellent way to defend yourself against trolls, online abuse, and the other vitriol we all inevitably come across occasionally. But what if you change your mind? Maybe you meet the person you blocked, and they turn out to be your new best friend. 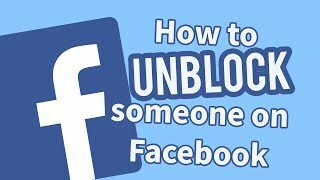 How do you unblock someone on Facebook? Whether you are learning the first steps of a programming language or you are a seasoned coder, collaboration is key to improving. Concepts like pair programming are prevalent in modern companies, but what options are there for collaboration in the home? 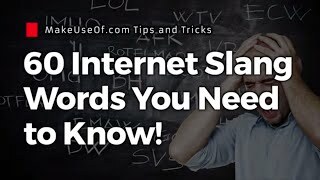 60 Internet Slang Terms You NEED to Know! The language of the internet evolves on a daily basis. Which means the internet can be a confusing place, even for someone who is using it every day. In fact, internet slang words have transformed language, so it’s crucial to learn the common phrases. 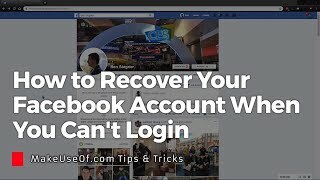 So you forgot your Facebook login and password and can’t log into Facebook anymore? Or was your Facebook account hacked, meaning you can’t access it anymore? 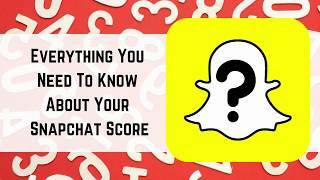 Snapchat Score: Everything You Need To Know! How is your Snapchat score calculated, and more importantly: how do you increase your Snapchat score?! Do you know your Snapchat score? The chances are you’ve seen the random number by your username at least once. Maybe you’ve even tried to increase your Snapchat score in the past. But do you know what your Snapchat score means? Like many frustrating Snapchat features, your score appears to be illogical. But don’t worry, as we’re here to tell you what your Snapchat score is and how to improve it. There’s no denying that Pokemon GO has given Nintendo’s franchise a new lease of life, bringing new fans on board and rekindling a love many once had for the Game Boy smash hit first released in 1996. Luckily it’s not the only way you can play Pokemon on your iPhone. Nintendo hasn’t released any classic or recent Pokemon games on the App Store, so you’ll have to turn to emulation to get the job done. 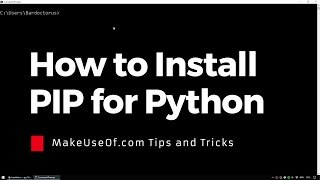 With one exception, the easiest way to do this is to pay a small fee and install apps from a service called Build Store. Best of all you don’t need to jailbreak your device to do this. James brought British foods on our trip to Las Vegas and it was...! In this video, we taste Twiglets, Turkish Delights, Mushy Peas, Licorice Allsorts, Mince Pies! Let us know in the comments what you think of these British snacks, and what other foods we might want to try next time. This video is sponsored by RØDE Microphones. Visit http://rode.com and join the creative revolution. Wait, is that Spotify's logo or the Wi-Fi icon? Did you notice the curved letters A and Z in Amazon's logo? You probably use WhatsApp every day, but could you draw their logo if your life depended on it? We challenged five tech geeks draw 10 various tech/app logos. You'll be surprised how difficult it is to recall the logos of apps and services we take for granted! 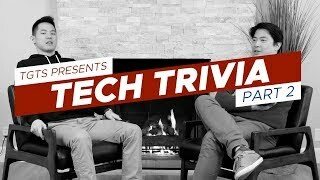 This is tech trivia, part 2! 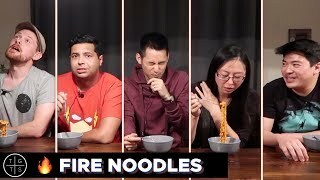 We shake things up in the episode - our guests will have to take a forkful of the dreaded FIRE NOODLES for every wrong answer. How do you think they'll fare? Who owns Motorola? What does the 410 HTTP status code mean? 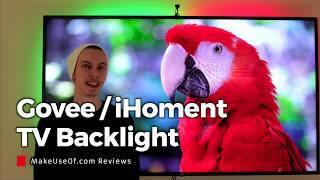 Is APE a lossy audio codec? If you know the answers to those questions, you should definitely consider yourself a geek. We'd like to thank RØDE Microphones for sponsoring this video. Visit http://rode.com and join the creative revolution. Rythme Gitan by Latché Swing is licensed under a Attribution-Noncommercial-Share Alike 2.0 France License. 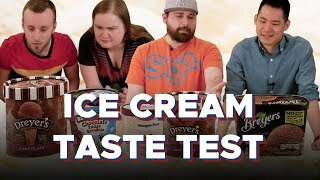 Joel, Dave, James, and Tina wear blindfolds and taste compare four different brands of chocolate ice cream: Ben and Jerry's, Häagen-Dazs, Dreyer's (Edy's), and Breyer's! Which one is the best? Which one is the worst? Let's find out! Tell us about your favorite brand of ice cream in the comments! Can you tell the difference between Coca-Cola, Pepsi, and generic cola? Could generic cola taste better than their branded counterparts? 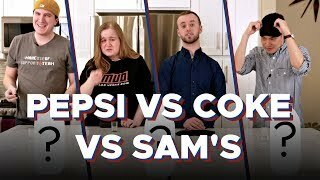 In this episode of Tech Geeks Try Stuff: Joel, Ben, Tina, and James pit their tastebuds against each other to determine if they can identify the various colas. They’ll have to guess between Coke, Pepsi, and Sam’s Cola (Walmart’s generic cola) and decide which tastes best. 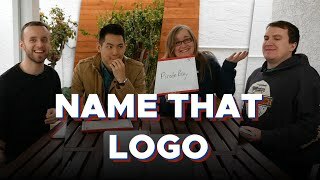 Joel, James, Tina, and Ben challenge each other to a game of Name That Logo! They'll be presented with 20 tech company logos and they'll have to guess which company it belongs to. It's actually much harder than it sounds! For every logo they guess correctly, they'll be awarded 10 points. Who will win this logo guessing challenge? Feel free to play along and share your score in the comments. Sorry about the plane noise! How well do you know your operating system and game console chimes? Can you identify the startup chimes from Windows 95, 98, XP, or Vista/7/8? 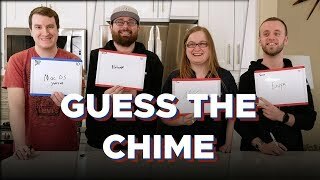 We challenged Ben, Dave, Tina, and James to guess 8 chimes from various operating systems startup sounds, game consoles, and online services. Feel free to play along and share your score in the comments! How well do you know your technology trivia? How old was Bill Gates when he founded Microsoft? Which company developed the PDF format? Do you know how much data the first production hard disk stored? Do you know what was the first phone to run Android? 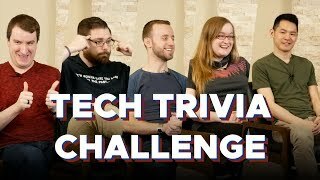 We challenged five geeks to a tech trivia quiz. They each have to answer 5 technology trivia questions to score 50 points. Feel free to play along and share your results in the comments. "Image of HP iPAQ HW910 PDA" by Asim18 is licensed under the Creative Commons Attribution-Share Alike 4.0 International license. "A pointing stick from a Lenovo T400 Laptop keyboard" by Inklein is licensed under the Creative Commons Attribution 3.0 Unported license. "The raspberry pi model B." by Justin417 is licensed under the Creative Commons Attribution-Share Alike 3.0 Unported license. GEEKS TRY RUSSIAN SNACKS AND SPACE FOOD! In this episode of Tech Geeks Try Stuff, we try snacks from MOTHER RUSSIA! Plus, we get a glimpse of what Russian cosmonauts/astronauts eat in SPACE! Ever wondered how Russian foods taste? Well, we got a glimpse. Thanks to our resident Russian Anya, we got to experience Russian caviar, Russian chocolates, Russian honey cakes, and other popular Russian foods. We even got to try SPACE FOOD which was insane! Tech geeks are typically found at a desk. In an office. Behind a cubicle. So when we got the chance to meet up in Berlin for IFA, we thought it might be a good idea to get together and try a bunch of the weirdest snacks from around the world. You know - to see what's out there. We literally bit off more than we could chew. 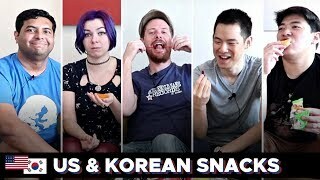 GEEKS TRY WEIRD US & KOREAN SNACKS: TWINKIES! SLIM JIM! DORITOS! What's in a Slim Jim? Do Hostess Twinkies expire? 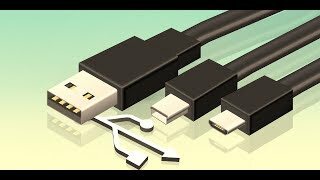 In this week's episode of Tech Geeks Try Stuff, Joel takes us on a journey of weird US snacks, starting with the unmistakeable Slim Jims. Is it a jerky? Is it beef? Who knows?! Then we feast on the cream-filled joy of Twinkies. Next up is Joel's favourite flavour of Doritos - Spicy Sweet Chilli (which was a winner - that's the best Doritos flavour we have ever tasted). Then we moved on to Korean snacks, and boy was it a lovely surprise! From Lotte's Custard Cream Cakes to shrimp crackers and Janggu (honey dipped snacks), they were the tastiest Korean snacks we've had. What a treat! 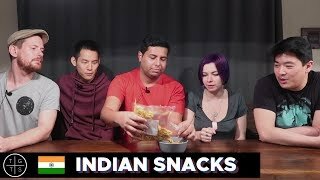 TECH GEEKS TRY STUFF: SPICY INDIAN SNACKS NEARLY KILLED ANYA! Right, this time the tech geeks braved the world of Indian snacks; some spicy, some not. The spicy one nearly killed Anya though. These were quick Indian snacks that they would have at tea time, so Indian tea time snacks like wafers, sing bhajiya, chakli, and farsan (which is similar to Bombay Mix). 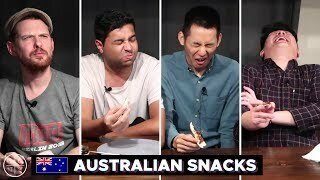 TECH GEEKS TRY STUFF: AWESOME AUSSIE SNACKS & WEIRD MUSK STICKS WTH? What exactly are musk sticks? Nevermind that, in this video, we'll tastes some of the finest and weirdest foods Australia has to offer. Some of them are actually pretty amazing (like Tim Tam and Kit Kat) - but we can't say the same for Vegemite. 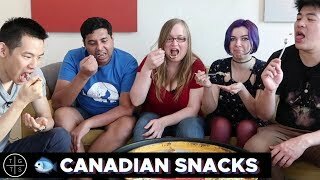 TECH GEEKS TRY STUFF: Weird Canadian Snacks - SOAP FLAVOUR CHEWING GUM, SMOKED SALMON CANDY?! It's true! We ate all that. 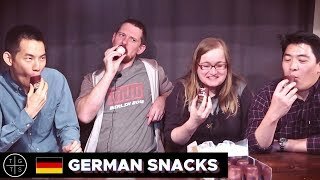 Again, Tina spoilt us with some really great snacks (see our weird German food video if you wanna know what I'm talking about https://www.youtube.com/watch?v=DeMOWPtTL80). This time, we tried some weird Canadian snacks featuring ketchup chips from Lays and Old Dutch, all dressed Ruffles (which I still maintain are the last crisps they make at the end of the day to clean out the machines), what turned out to be cat food, but at least there was a saving grace: Jos Louis. Ah, lovely chocolate covered velvet cake. Have you tried any of these weird Canadian snacks? Let us know in the comments. CAN YOU FEEL THE BURN of 8k SCOVILLE? So we tried 2x korean fire noodles - and honestly, it wasn't a proper challenge because we split 2 packets among 5 of us (yeah we were in Berlin and fire noodles was in short supply). Still, 8,800 Scoville. Yeah. Also, we tried Jackson's potential cure for spiciness - you guessed it - chocolate. Did it work? Ask Joel. 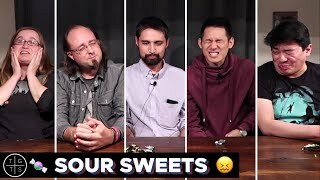 TECH GEEKS TRY STUFF: Mouth Melting Sour Candy! Can sour sweets melt your mouth? Apparently. So we tried a bunch of sour candy to gauge how sour they really are. Turns out, not overly sour but your mouth will melt from eating too many of them. Then rated by our resident sour sweet expert, James Bruce. TECH GEEKS TRY STUFF: Weird German Foods - Pickled fish for breakfast, blood spread with bits? Four tech geeks brave some of the weirdest German foods. Featuring rollmops (pickled herring) which nearly killed Jackson, liverwurst, blood sausages (they were actually just a paste, but yuck), Waldmeister (a green poisonous drink), and SUPER DICKMANN'S. Yeah, we definitely tasted some weird German foods. If you're brave enough, these are certainly some of the weirdest German foods to try.